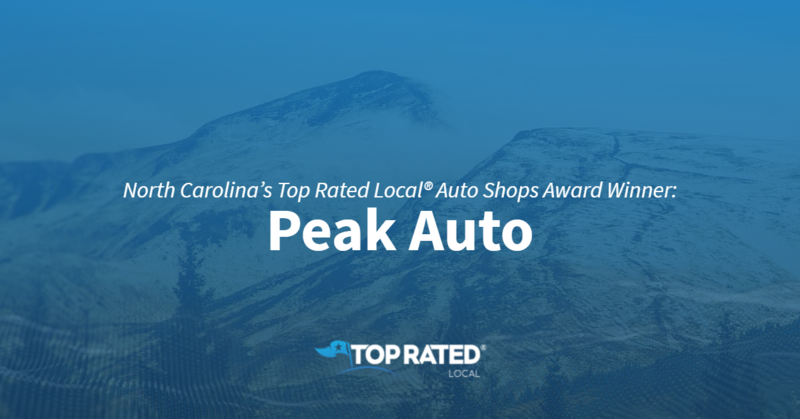 Top Rated Local® is pleased to announce that Peak Auto is a 2019 award winner for auto shops in North Carolina! For expert auto service in Apex, you won’t find a better auto shop to turn to than Peak Auto. Peak Auto has received hundreds of reviews on five verified sites with an average rating of 4.82 stars, earning them a spectacular Rating Score™ of 98.23 and a 2019 Top Rated Local award for ranking among the top 10 auto shops in all of North Carolina! 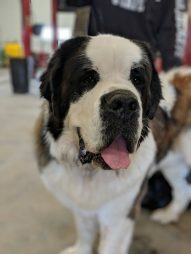 “[I] had some major work done recently on my car here. I was pleasantly surprised after getting one of the lowest upfront quotes for the work from Daran. I was a bit skeptical at first, but Daran did an excellent job and was very honest and true to his word. They even had to do some extra work to put in another part that had gone bad, but did not charge extra! I feel like I found someone very honest I would not hesitate to trust going forward.” – Vivek R.
We wanted to learn a little more about Peak Auto and its stand-out online reputation, so we took a few minutes to talk with the owner, Daran Thomas. The first thing we wanted to know was what it is that sets Peak Auto apart from their competition in North Carolina. Daran told us that a lot of customers are new to the area, and what distinguishes Peak Auto apart is their friendly atmosphere, positive reviews and the fact that they embrace every single customer and try to educate them what’s going on and why. Daran went on to tell us about the convenience Peak Auto offers their clients through night-time drop-offs, after-hours pick-ups and loaner cars. Daran attributes Peak Auto’s strong online reputation to their attention to detail and understanding about what the customer needs, as well as to their commitment to meeting their clients’ expectations. Outside of building a powerful online reputation, Peak’s Auto has spread the word about who they are and what they do by following up with customers through the internet and print, as well as through seasonal promotions based on the changing weather. Congratulations to the team at Peak Auto for being a 2019 Top Rated Local award winner, and thank you so much, Daran, for taking the time to speak with us! We highly recommend Peak Auto in Apex. Visit their website today! Top Rated Local® is pleased to announce that Yankton Auto Body is a 2019 award winner for auto shops in South Dakota! When you need auto service in Yankton, there’s no better shop to turn to than Yankton Auto Body. Yankton Auto Body has received dozens of reviews on three verified sites with an average rating of 5.00 stars, earning them a fabulous Rating Score™ of 96.00 and two 2019 Top Rated Local awards for ranking among the top 100 businesses and the top 10 auto shops in South Dakota! “I have been meaning to write this review for months. These people are GREAT! I hit a deer, and they not only made my front end look brand new, but they also made us aware of a recall our vehicle had. They took it to Dodge and had them fix the recall AND detail our vehicle AT NO EXTRA COST TO US! Now that is service. [I] would definitely recommend [them]!” – Gia T.
Casey Lecher, the co-founder of Yankton Auto Body, generously gave us a few minutes of her time to tell us about her award-winning business and its phenomenal online reputation. 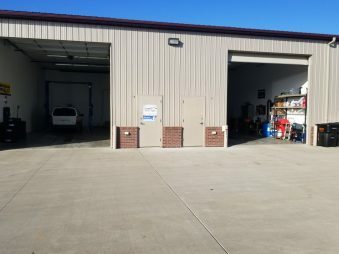 Outside of building a powerful online reputation, Yankton Auto Body has gotten their name out there through advertising, as well as through their Facebook and Google business pages. Congratulations to the team at Yankton Auto Body for being a 2019 Top Rated Local award winner, and thank you so much, Casey, for taking the time to speak with us! 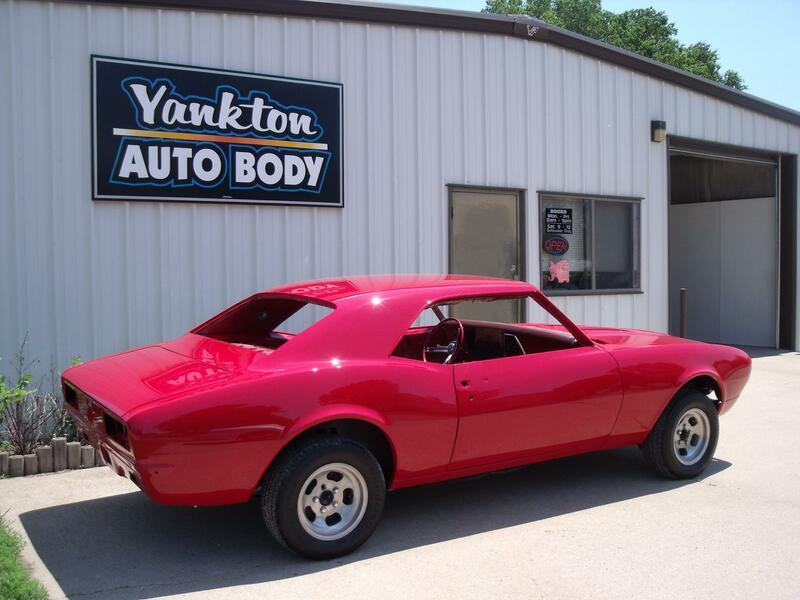 We highly recommend Yankton Auto Body. Visit their website today! 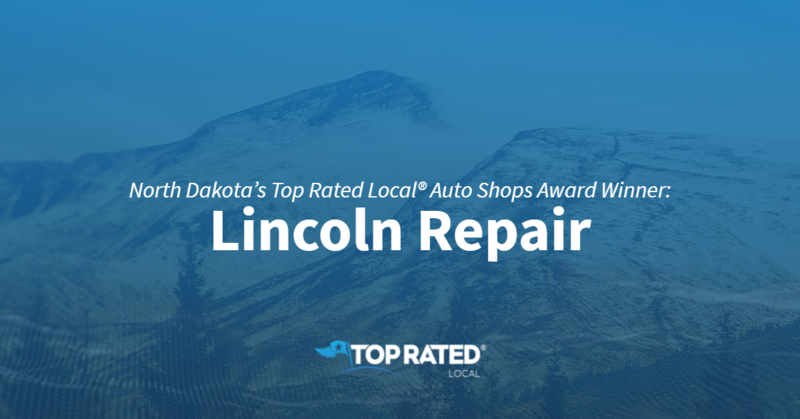 Top Rated Local® is pleased to announce that Lincoln Repair is a 2019 award winner for auto shops in North Dakota! When you need auto repair in Bismarck, there’s no better auto shop to turn to than Lincoln Repair. Lincoln Repair has received dozens of reviews on three verified sites with an average rating of 5.00 stars, earning them an outstanding Rating Score™ of 97.00 and a 2019 Top Rated Local award for ranking among the top 10 auto shops in all of North Dakota! “I took my 1965 Mustang GT to Lincoln Repair to have a new horn installed. Josh took the time to see what I wanted, looked over the options of where to mount the horn and mounted it. Josh is very professional and listens to the customers’ needs. Josh has been working on vehicles for a long time. His knowledge of vehicles is an expertise. He is reasonably priced on the work he does. He doesn’t try to sell you something fancy. He listens to the customer. He is an ASE certified mechanic, so you know you’re getting the best.” – Jody S.
Josh Gendron, the owner of Lincoln Repair, generously gave us a few minutes of his time to tell us about his award-winning business and its fantastic online reputation. The first question we had for Josh was what sets Lincoln Repair apart from their competition in North Dakota. Josh points to the passion he and his team have for the job, as well as to the fact that they are all highly trained. Josh attributes Lincoln Repair’s strong online reputation to their commitment to taking care of their customers. Outside of building a powerful online reputation, Lincoln Repair has spread the word about who they are and what they do through word of mouth, which speaks to the next-level service they provide. Congratulations to the team at Lincoln Repair for being a 2019 Top Rated Local award winner, and thank you so much, Josh, for taking the time to speak with us! We highly recommend Lincoln Repair in Bismarck. Visit their website today! 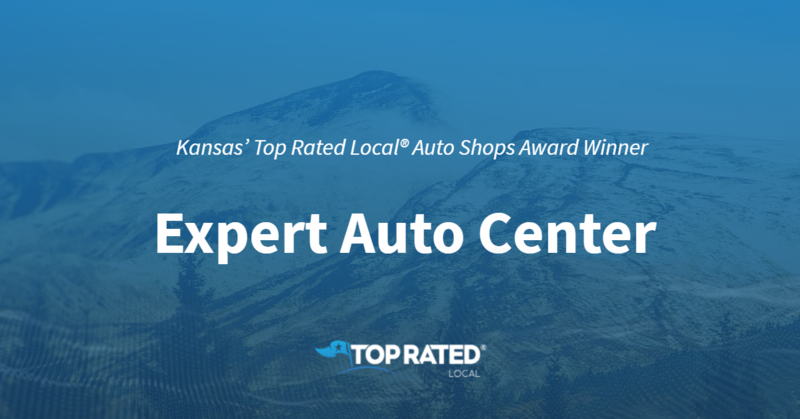 Top Rated Local® is pleased to announce that Expert Auto Center is an award winner for auto shops in 2019. If you are looking for an auto shop that will provide quality work paired with excellent service, look no further than this award-winning company! Expert Auto Center has received many overwhelmingly positive reviews across four different verified sites with an average rating of 4.71 stars, earning them an impressive Rating Score™ of 95.13 and a 2019 Top Rated Local award for ranking as one of the top 10 auto shops in Kansas! “These guys are first-rate. [They are] fast, well-equipped, experienced, and very fair. They won’t do a repair without calling you. [They are] nice people, too. [This is] now my go-to place.” – B.W. It is because of excellent reviews like this that Expert Auto Center is now able to call themselves a Top Rated Local award winner! We were excited to learn all about how Expert Auto Center has been able to build such an impressive reputation, so we sat down with the Office Manager, Anthony Sullivan. 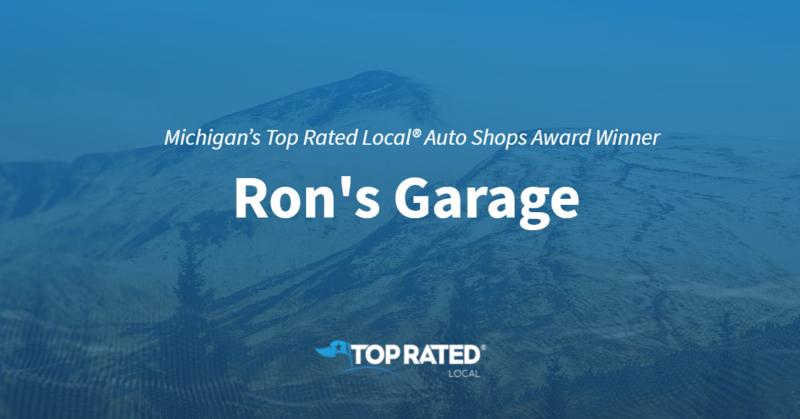 Congratulations to Expert Auto Center for being a 2019 Top Rated Local award winner, and special thanks to Anthony for taking the time to speak with us! Top Rated Local® is pleased to announce that Jimmy’s Automotive And Tire is an award winner for auto shops in 2019. For any and all of your auto care needs, we highly recommend checking out this local, family-owned staple! 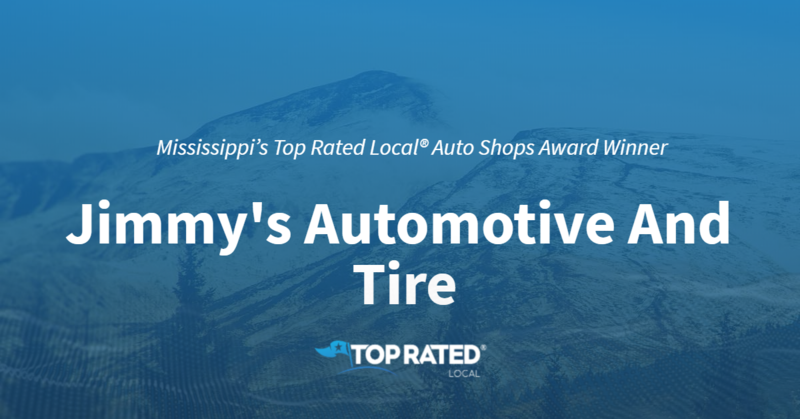 Jimmy’s Automotive And Tire has received many overwhelmingly positive reviews across multiple verified sites with an average rating of 4.94 stars, earning them an impressive Rating Score™ of 93.38 and a 2019 Top Rated Local award for ranking as one of the top 10 auto shops in Mississippi! “[They do] honest work, [and offer] reasonable pricing… [I have never run into any] issues. [I] highly recommended [them] based on my experience and that of others I’ve heard from.” -D.T. It is because of excellent reviews like this that Jimmy’s Automotive And Tire is now able to call themselves a Top Rated Local award winner! We were excited to learn all about how Jimmy’s Automotive And Tire has been able to build such an impressive reputation, so we sat down with the owner, Jimmy. With as impressive a reputation as Jimmy’s Automotive And Tire has, it is no wonder word of mouth has been their primary source for new clients. In fact, Jimmy tells us they really don’t invest in any other kind of marketing. Since they have been a local staple for so many years, they have seen multiple generations of families come through their door as customers. Word-of-mouth has been their primary source for new and returning customers. Congratulations to Jimmy’s Automotive And Tire for being a 2019 Top Rated Local award winner, and special thanks to Jimmy for taking the time to speak with us! 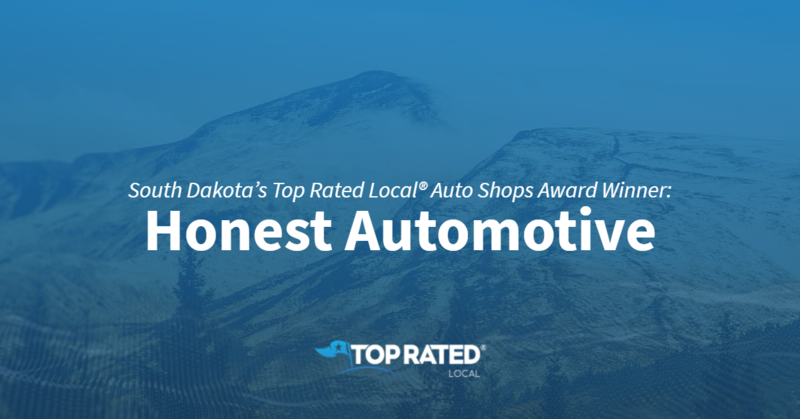 Top Rated Local® is pleased to announce that Honest Automotive is a 2019 award winner for auto shops in South Dakota! For reliable, professional auto services in Rapid City, there’s no better option than Honest Automotive. Honest Automotive has received dozens of reviews on four verified sites, earning them a fabulous Rating Score™ of 97.21 and two 2019 Top Rated Local awards — one for being ranked among the top 100 businesses in South Dakota and one for being ranked the number one auto shop in South Dakota! “Can I give more than five stars?? A short overnight trip to SD left me and my family stranded in Rapid City. John went above and beyond to help me out and get us safely back on the road home. I have no doubt that he made my vehicle a priority that day and quite literally saved me hundreds of dollars in hotel and travel expenses related to his quick diagnosis and repair of the problem. I can’t thank you enough, John. Your customer service was exemplary, and I felt like an old friend was helping me out, not a complete stranger. Your name says it all. — Honest Automotive.” – Michelle N.
John Maxon and Rick Soulek, the co-owners of Honest Automotive, generously gave us a few minutes of their time to tell us a little more about their award-winning business and its impressive online reputation. John and Rick went on to tell us that Honest Automotive is active in both their community and through the VFW. Outside of building a powerful online reputation, Honest Automotive has spread the word about who they are and what they do through their website and by being active on Facebook and other social media platforms. Congratulations to the team at Honest Automotive for being a 2019 Top Rated Local award winner, and thank you so much, John and Rick, for taking the time to speak with us! For all of your auto service needs in Rapid City, we highly recommend Honest Automotive. Visit their website today! 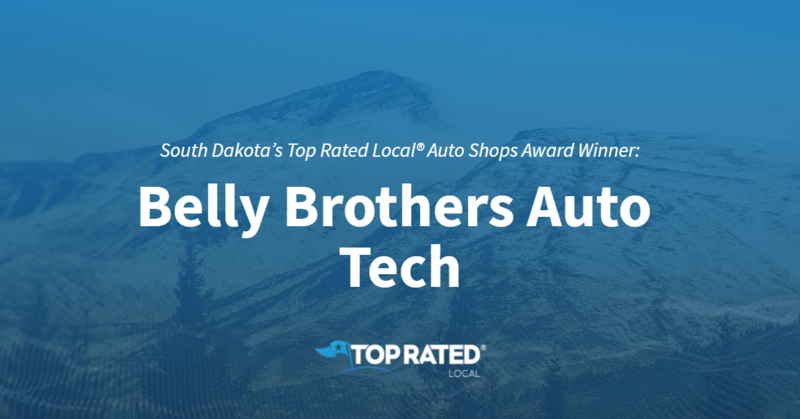 Top Rated Local® is pleased to announce that Belly Brothers Auto Tech is a 2019 award winner for auto shops in South Dakota! When it comes to auto repair and preventative maintenance, Belly Brother Auto Tech is the company to call in Rapid City. Belly Brothers Auto Tech has received dozens of reviews on three verified sites with an average rating of 4.95 stars, earning them a phenomenal Rating Score™ of 95.51 and a 2019 Top Rated Local award for ranking among the top 10 auto shops in all of South Dakota! “I had a very pleasant experience using Belly Brothers Auto. They were friendly and gave me a very reasonable price. It took longer than expected, but they were in contact with me a few times to let me know how it was going. By longer, I mean it was supposed to be done the same day, but it was the next day, and they stayed late to finish. I have and will recommend them to friends and family.” – Jade A.
Jennifer Young, a partner at Belly Brother Auto Tech, generously gave us a few minutes of her time to tell us about this award-winning business and its impressive online reputation. Jennifer attributes Belly Brothers Auto Tech’s strong online reputation to their commitment to honesty and to doing the best they can to ensure that their customers are safe on the road. Outside of building a powerful online reputation, Belly Brothers Auto Tech has gotten their name out there through their A+ rating with the Better Business Bureau, their local radio ads and their sponsorships of local high school softball and bowling teams. Congratulations to the team at Belly Brothers Auto Tech for being a 2019 Top Rated Local award winner, and thank you so much, Jennifer, for taking the time to speak with us! We highly recommend Belly Brothers Auto Tech in Rapid City. Visit their website today! Minnesota’s Top Rated Local® Auto Shops Award Winner: Eastman Auto Repair, Inc.
Top Rated Local® is pleased to announce that Eastman Auto Repair, Inc. is an award winner for auto shops in 2019. For all of your auto repair needs in Rochester, Minnesota, we highly suggest stopping by this local favorite! Eastman Auto Repair, Inc. has received many overwhelmingly positive reviews across four different verified sites with an average rating of 4.89 stars, earning them an impressive Rating Score™ of 96.90 and a 2019 Top Rated Local award for ranking as one of the top 10 auto shops in Minnesota! “[They were] very honest, professional, and kind. [They were] super easy to work with, as I was able to get my car in for service the next day! I called all around Rochester for quotes and these guys beat all their prices tenfold! !” – H.H. It is because of excellent reviews like this that Eastman Auto Repair, Inc. is now able to call themselves a Top Rated Local award winner! We were excited to learn all about how Eastman Auto Repair, Inc. has been able to build such an impressive reputation, so we sat down with the General Manager, James Heydt. Eastman Auto Repair, Inc. has managed to build a truly impressive online reputation. When we asked James how they have built this reputation, he shared that they utilize social media platforms like Facebook, Instagram, and Twitter. They also use SMS messaging to send reminders to their customers. Offline, they have also marketed their business by having a cool-looking building. They had an artist paint cars from The Fast and the Furious on their building in a way that they appear to be 3D to passers-by. Eastman Auto Repair, Inc. is passionate about being available to their customers. They are open for business six days a week and are always looking for more ways to get involved in the community. Currently, they host a drive-in-movie night. This care for community, cars, and customers was present through our entire chat with James and is reflected in some of the fantastic reviews that have been left for Eastman Auto Repair. Congratulations to Eastman Auto Repair, Inc. for being a 2019 Top Rated Local award winner, and special thanks to James for taking the time to speak with us! 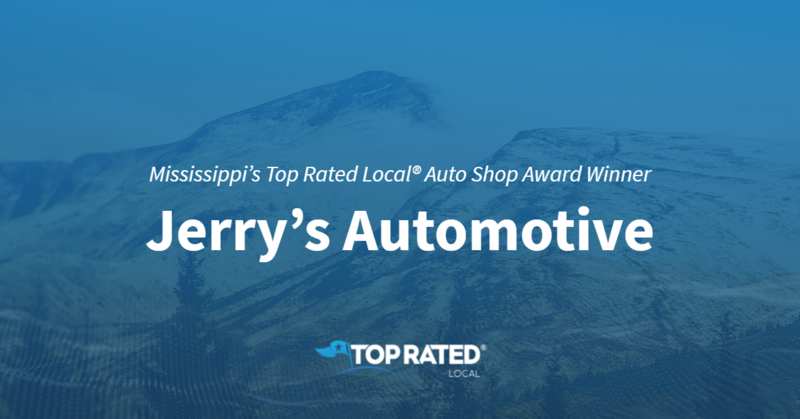 Top Rated Local® is pleased to announce Jerry’s Automotive is a 2019 award winner! 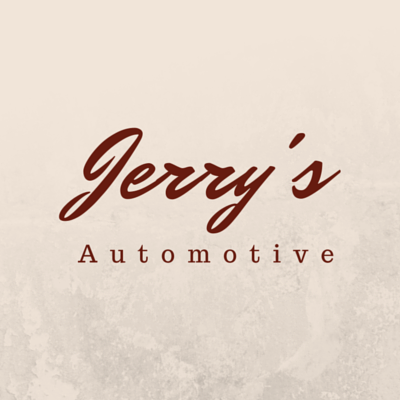 “Jerry’s Automotive is run by fantastic mechanics, and their customer service is top notch. I would recommend them to anyone who needs professional work done on their vehicle. They communicate with their customers and are genuinely pleasant to do business with. Five well-earned stars for Jerry’s Automotive.” -Adam B.
Connie Callahan and Gary Gleason, the office manager and service manager of Jerry’s Automotive, took some time to chat with us about the business’ incredible online reputation. The Jerry’s Automotive team focuses on providing quality repairs at a fair price. The business is built on honesty and integrity. Congratulations to the team at Jerry’s Automotive for being a 2019 Top Rated Local award winner, and thank you so much, Connie and Gary, for taking the time to speak with us!